The Seagulls chief has also said that the first team manager is getting all the credit he deserves at the club having led them to the Premier League. Bloom - who took over as chairman eight years ago - has led the tributes to Hughton after turning the club’s fortunes around in his two and a half years as manager. He took over on December 31, 2014, with Albion 21st in the Championship, one place above the relegation zone. Since then, Albion missed out on automatic promotion on goal difference last year, before losing in the play-offs. 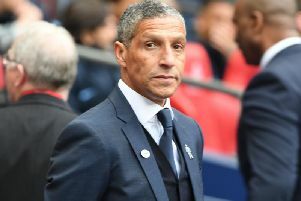 But Hughton has gone about his business quietly and professionally during his tenure and Albion have stormed to promotion this season, with the Championship title also set to follow. Bloom said: “Chris has been here for two and a half seasons, he has done an magnificent job. We were in a bad position in early January when he first came in. The first stage of what he needed to do was to keep us up which he did. It wasn’t pretty, it wasn’t easy, but sometimes you have that in football. “Unless you are one of the biggest clubs in the world you will have bad seasons. In fact, some of the biggest clubs have bad seasons which we have seen in recent times. As a club we have recruited very well in the last few windows and the team work and spirit within the players is fantastic. “He has done remarkably well in a very, very tough league. With 46 league games and cup games as well, to get the points he has done is superb. It’s very well deserved and I think he has done magnificently. “He is one of the most respected managers in football. Does he get the credit he deserves? That’s probably for you to judge, but he certainly gets a lot of respect and huge amount of credit from me.